The Hoochie Coochie – a belly dance or a lap dance suggestively performed by women, and popular in Chicago in the late 19th Century. 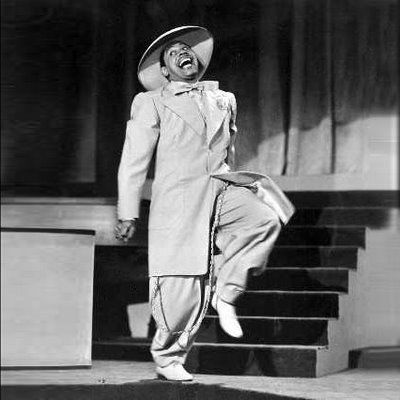 Remember Cab Calloway’s Minnie the Moocher … she is a either a “red-hot” or a “low-down” hoochie-coocher – or both. A man managing hoochie cooche dancers, or putting on a hoochie coochie show, or watching one, might be labelled a Hoochie Coochie Man … and so the title for this Willie Dixon composed song. His songs have been performed & recorded by many, many have become blues standards … and been very influential. Perhaps too influential – in 1987 Led Zeppelin settled out of court with Dixon. Dixon’s claim was for copyright infringement for the songs Bring It On Home & Whole Lotta Love. Dixon’s biography is well worth a read … one notable episode of trouble for him was his stance on being drafted into the US Army. He was a conscientious objector claiming that exploitation of blacks should mean they are exempted from drafted. The original 1954 recording had a stellar line-up: Muddy Waters, Willie Dixon, Jimmy Rogers, Little Walter, Otis Spann, & Fred Below. I first heard the song in about 1970, on the Muddy Waters album – Live at Newport 1960. The song was first added to my collection when I bought the Allman Brothers Band second album, Idlewild South – it remains one of my favourite versions of the song and was the westerly option at Crossroad #5 – Voodoo Chile. So what’s the link between (I’m Your) Hoochie Coochie Man and Don’t Take Everybody To Be Your Friend? Muddy Waters and Sister Rosetta Tharpe were both riding along in 1964 in The Blues & Gospel Caravan tour of England. It is very unfortunate that this first video ends abruptly but it is the only clip I could find of Muddy at Newport. The second has the complete song, this clip starts with about 2m 30s of Muddy Waters chatting about his roots. 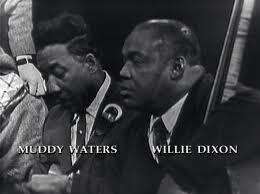 * Willie Dixon’s songs – a wikipedia page that lists Dixon’s main songs and who they have been recorded by. * Official Willie Dixon website. 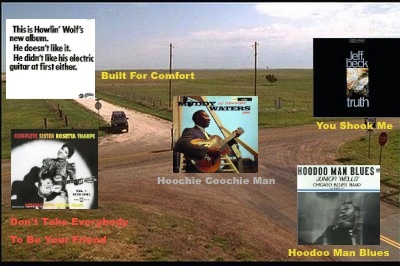 * Hoochie Coochie Man playlist on YouTube – 7 recordings of the song by Willie Dixon; Buddy Guy; The Allman Brothers; Steppenwolf; Jimi Hendrix; Paul Rodgers; Buddy Guy & Eric Clapton. * A (very) short Muddy Waters biography (3m 49s) – with comments from Keith Richards, Bob Dylan, Charlie Musselwhite and others. * A Superstar Blues Jam 1966 – watch this. Nothing to do with Hoochie Coochie Man but it does feature Muddy Waters, Willie Dixon, Otis Spann and a few other greats. Yeah, it seems to be an undeniable truth – take everybody to be your friend and you guarantee some hurt, cos’ some people are just plain bad. And cause you to lose your home. It sounds like a bit of back-stabbing disrespect prompted the advice about not accepting everyone as a friend and the realisations that a true friend is hard to find. Maybe taking everybody to be your friend will mean you get smacked down, betrayed, injured or hurt. And maybe it’s just the price you have to pay for being open to friendship. What connects Don’t Take Everybody To Be Your Friend & It Ain’t Necessarily So. Sister Rosetta Tharpe and Cab Calloway performed and recorded together. 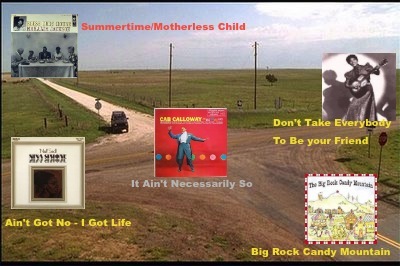 The songs are both telling us to beware or be aware … or both. * Johnny Cash sings the song in his inimitable style. * Didn’t It Rain – Sister Rosetta Tharpe – a great clip recorded in 1964 during an tour of England that was entitled The Blues & Gospel Caravan – the Caravan included Muddy Waters, Otis Spann, Sonny Terry & Brownie McPhee, Reverend Gary Davis & a swag of others. This performance is at a disused railway station near Manchester. The audience on one platform, the performers on another, railway tracks between them. * Sister Rosetta Tharpe – Godmother of Rock & Roll – PBS – American Masters episode about Sister Rosetta Tharpe. The link takes you to the page of this episode that has the filmmaker – Mick Csaky – talking about the film for 11m 52s. On the right hand side of this page you will see a list of other resources you can use to find more information about her. Unfortunately, the film can’t be viewed in this region. * Shout, Sister, Shout! – this website is an offshoot of the 2007 book Shout, Sister, Shout! The Untold Story Of Rock-And-Roll Trailblazer Sister Rosetta Tharpe. This link takes you to an interview with author, Gayle Wald. 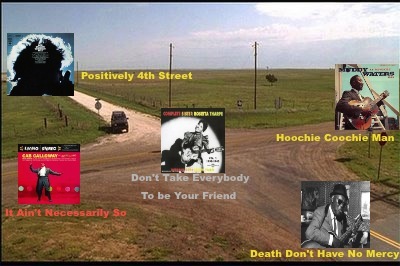 North: Positively 4th Street by Bob Dylan. East: (I’m Your) Hoochie Coochie Man by Muddy Waters.